You wouldn't be wrong to call the Toyota Camry the almost boringly safe pick of the segment. A big and comfortable family sedan with unquestionable reliability - that’s what the Camry’s been known for. But let's be honest, there wasn’t much else. It just felt like a Corolla, but bigger. But look at this one. It’s edgier with a new platform, loaded with new tech and looks like it is ready to offer something more, something extra. So now, has Toyota finally made the Camry desirable for those people who otherwise would never consider getting one? Wait, This Is A Camry? Indeed it is. In profile, the Camry does have some hints of the sixth-gen car but as far as design goes, it’s as distinctive as it gets. Outside, it has a stronger personality. While the old model did grab attention, it was mainly for its size, not any notable design distinction. This one has both. The Camry has lost a little height, but is longer (+35mm), wider (+15mm) and has a bigger wheelbase (+50mm) than before. Hand in hand, the Camry now has an attitude to its styling, with the sleek LED projector headlights and LED DRLs that make the car look like it has war paint on its face. There’s also a plus-sized lower grille that, much like in many Lexus cars, makes you wonder if you bought the grille and just happened to get the car attached with it. The wheel design is a little busy but is in keeping with the Camry’s styling that’s no longer subdued and at 18 inches, is a size larger than before too. The rear end, oddly, hasn’t been highlighted much on Toyota’s website/promotional materials (the brochure doesn’t have even one image from this angle!) and it’s hard to see why. It’s gorgeous! The coupe-like roofline swoops into a fairly wide rear end so it has a sporty stance with well defined haunches. From a distance, you can even see some similarities with the BMW 7 Series, especially when the Camry’s draped in black. If you turn up somewhere in this Camry, heads will turn and stay there for a while. The first question to answer is, does it still have a big Corolla vibe? Nope, this is a cabin with an appeal of its own and it does feel unique. 7-inch - that’s the size of the new multi-information display that has a wide range of functions, including reading out driving data, displaying the tyre pressures and even controlling the rear sunshade or park assist. 8-inch - it’s the size of the Camry’s touchscreen infotainment system that’s paired with a 9-speaker JBL sound system. To top it all off, there’s a 10-inch head-up display which’ll show you everything from the digital tacho & speedo to a compass, cruise control info and what song’s playing if you’re streaming audio. Oh yes, there’s a tilt and slide sunroof too. So everything seems to be a leap ahead. Any caveats? Some, yes. One is the familiarity in certain aspects. Toyota owners will be closely acquainted with some of the controls, like the steering-mounted buttons, the volume knob and climate controls. The plastic flaps that cover the front USB & power sockets feel a touch industrial and even the infotainment system UI looks dated. It isn’t nearly as polished as what Skoda offers in the Superb. But by and large, that’s it. Nothing you’d call a dealbreaker. In many (good) ways, it’s un-Camry like and Toyota insists it’s unlike past Camrys in one big way. But First, Here’s Some Boring! The new Camry is based on the Toyota New Global Architecture (TNGA), which also underpins the Lexus ES 300h. Platform aside, you’re also getting the same powertrain as that Rs 60 lakh luxury sedan - a 2.5-litre petrol engine combined with a hybrid powertrain that offers a combined output of 218PS and a peak torque of 221Nm. Much like it is in the Lexus ES, the transition between the petrol engine, electric motor & generator is all seamless. When you start off, the Camry is automatically in electric mode, unless the battery’s insufficiently charged. At low and crawling city speeds, the Camry hybrid stays in pure EV mode and is dead silent while making progress. Once you go faster or get a little heavy on the gas pedal, the petrol engine kicks in. The noise and vibration insulation is excellent. So much so that even when the petrol heart activates, it doesn’t feel much different than when a car’s AC compressor kicks in at a standstill. The Camry hybrid is constantly calculating how it can get the best efficiency. We can vouch for the fact that this actually works in the real world. In our road tests, the old Camry, with a claimed fuel efficiency of 19.11kmpl, delivered 14.29kmpl in the city and 18.30kmpl on the highway. That’s on par with what we extracted from the BMW 520d. The new Camry hybrid’s claimed efficiency stands at 23.27kmpl, so clearly, there’s reason to be optimistic. That said, the fuel tank capacity has dropped to 50 litres from 65 litres, so the bearing on outright tank range isn’t as rosy. That’s all the sensible stuff. Why does Toyota insist there’s a new realm to being in the driver’s seat? That’s because this Camry is a good handler. 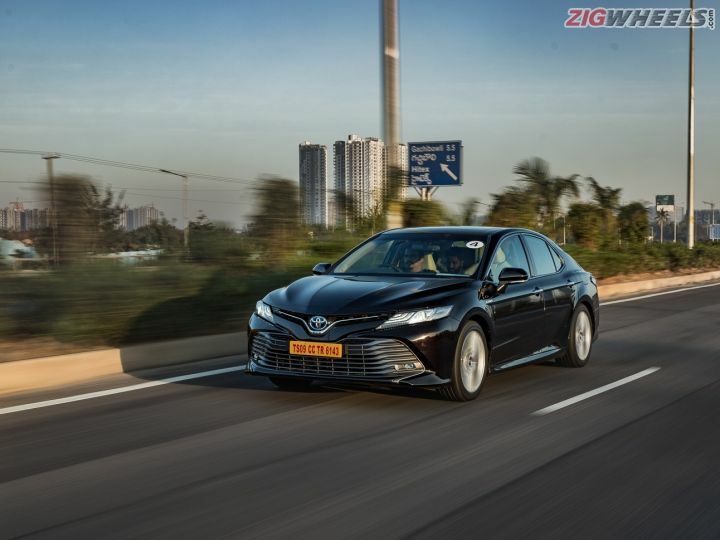 Sure, it’s not Skoda Superb precise but the new Camry hybrid can make you smile and actually look forward to being in the driver’s seat - not the natural habitat of a Camry owner in India. The steering isn’t vague or slow like in the old one. Set it to sport mode and it feels well-weighted and involving. TNGA has also given the Camry a new lease of life, as the body backs up this steering characteristic. Do you feel its size? Yes, It’s nearly 5-metres long after all. But the impact is not so much that you’d hesitate to push it. Quick switchbacks are no hassle because it stays flat and requires much less corrective steer. The Camry is no longer overtly soft and the suspension doesn’t have the rebound that’d unsettle the old one through corners. How so? Well, even though this Camry is some 30kg heavier than the old one, it has independent (double wishbone) rear suspension and the car’s torsional rigidity is up by a good 30 per cent. It’s turned some excess fat into muscle. The powertrain also offers good punch. It’s not the type of performance that’ll throw you back into your seat, but punch it and there’s plenty to get into triple digits in a snap or make overtakes without having to plan them, even from 100kmph. But now, it’s time to snap back to reality, because ultimately, in a Camry, the rear seat’s got the real gravity. Nope, not this time around. A grouse with the old Camry was its ride, which was certainly comfortable, but excessively so. Even when smooth roads had changes in levelling, the ride would get bouncy and take a while to get settled again. Now, however, the ride is mature. Not a far cry from the Volkswagen Passat that, unlike the Camry, employs adaptive dampers. Bad roads, potholes, poorly levelled roads, the new Toyota Camry deals with them all while insulating the occupants from what’s below and without the bounciness as collateral damage. And no it’s not just the ride that’ll make you enjoy the rear seat. There’s oodles of cabin space and if you want more, you can always adjust the front passenger’s seat to your liking via controls placed on the side of the front seat. The Camry also offers 3-zone climate control, and like before, a powered rear sunblind and electrically reclining rear seats. The controls for these, along with the music system, are integrated into the rear armrest for easy access. While the old one had these too, the new one gets a touchpad for these functions, instead of physical buttons. The safety package is strong as ever too, including 9 airbags, ABS with EBD, brake assist, traction control and vehicle stability control. To answer the original question, yes. Toyota has made the new Camry so much more desirable with cooler gizmos, a significantly better ride and handling package and statement making styling. With these, the new Toyota Camry is a thorough upgrade over the car it replaces and at Rs 36.95 lakh (ex-showroom Delhi), leaves little reason to choose the over-Rs 6 lakh more expensive, Honda Accord Hybrid. However, with the FAME incentives now retracted, it’s also a lot more expensive than a non-hybrid petrol alternative like the Skoda Superb, the top-spec of which, is also Rs 6 lakh cheaper than the Camry Hybrid. And that does water down the appeal of the Camry’s superior fuel efficiency. So even with its brand new and more appealing persona, the deal closer is, in no small part, the Toyota brand promise and everything that comes with it.